Just steps from Front Street in the heart of Lahaina town, this hotel is a sanctuary of contemporary serenity. The pool and pool pavilion add to the composed setting. Condominiums are beautifully accented with natural stone, tropical woods, and colors of russet and bronze that effortlessly combine to create an atmosphere of comfort and ease. Accommodations include studios with kitchenette plus one- and two-bedroom suites with full kitchen and washer/dryer. 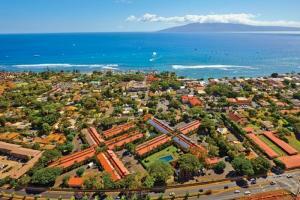 Located in the heart of Lahaina town, just steps from famous Front Street and Lahaina Harbor. A multitude of restaurants are located nearby in Lahaina. Additionally, each unit offers a kitchenette or full kitchen. Lahaina Town, Luaus, Snorkeling, Shopping.